Connie has been in the restaurant business for over 26 years and is following her passion for Wedding cake designing and decorating. She has been published in American Cake Magazine and Wedding Cake Magazine, United Kingdom, for western cake design. Connie is known for her western & elegant designs and decorating. But from western to elegant, she can custom design for each client a one-of-a-kind cake for that special day. Connie is also part of Icing Smiles, an organization that believes in Baking a Difference. Icing Smiles is a nonprofit organization that provides custom celebration cakes and other treats to families impacted by the critical illness of a child. Icing Smiles understand that the simple things, like a birthday cake, are luxuries to a family battling illness. Their goal is to create a custom cake for the ill child, or their sibling, that provides a temporary escape from worry and creates a positive memory during a difficult time. 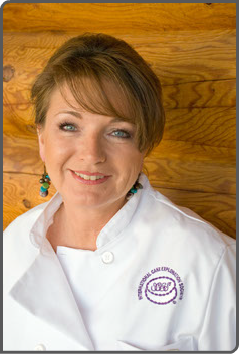 Connie is a member of International Cake Exploration Societe’ (ICES) an international organization that serves over 4,000 registered members from around the world in an effort to preserve, advance and encourage exploration of the sugar arts. Thank you for taking time to look at my site, If I can help you with any of your wedding needs, please don't hesitate to call or e-mail me. I also hold classes, And if anything interests you, please contact me.